Home Uncategories Number one? No way! I haven't written in a while. So much going on. But I had to make a quick note of something amazing! My book Dream Lover is available for free today. The promotion started yesterday. Well sometime yesterday morning I noticed my book was #10 on the Best Sellers list in the Top 100 Free books in the African American genre! What was even more unbelievable was throughout the day, but book rose in its position-until it ended up in the number spot! 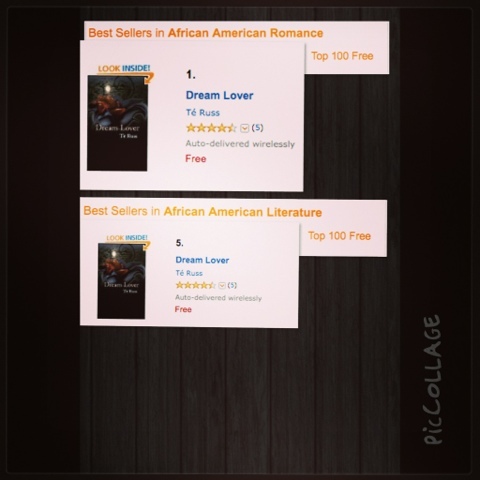 The book was also ranked as #5 on the Best Sellers list in the Top Free 100 Free in African American Literature! I'm honored and excited that so many have downloaded the book. My goal from the beginning was to simply get this book out there for people to enjoy! I hope people are actually doing that. And I would appreciate reviews! So far I've gotten good reviews on the book which is also exciting! Taking Chances is coming, I know I've been saying that; as a wife and mother of three things get hectic. But we've just got to get the cover finished. I'm hoping by mid March Taking Chances will be out!